Piers Morgan believes all America needs is a “cool president”. Forget the crisis of high unemployment, a dismal economy, and an escalating burden of debt that puts our national security at risk. We just need someone like Obama who can “sing like Al Green and joke like the best comedian”, because “it’s good for America”. There could not have been a better interview to launch Jonah Goldberg’s new book, “The Tyranny of Cliches”, than the one the author suffered through under the ironic, cliché-ridden, Liberal wrath of Piers Morgan. The CNN host’s appallingly biased and unprofessional behavior cannot be accurately called an “interview”. Instead, it was a hostile interrogation with all of the scornful antagonism CNN finds appropriate to show a “guest” of the network. It’s obvious Jonah Goldberg’s new book calling out Liberals as unthinking repeaters of doctrinal and clichéd rhetoric hit a truth nerve with Morgan, and his poor Socialist nervous system couldn’t take it. …linked below and a must-see if you want a good hard look at the face of a mainstream media frustrated by Barack Obama’s standing in the polls and pathetic handling of the one-year anniversary of the Navy SEAL operation that resulted in the death of Osama bin Laden. 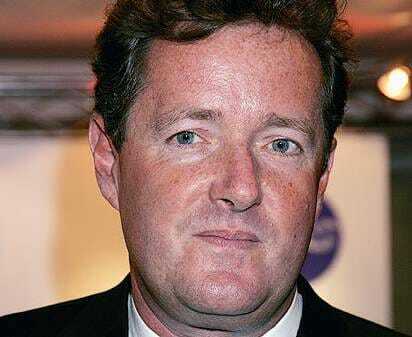 In my mind, at least, that’s the only explanation for Piers’ abysmal behavior. Jonah Goldberg isn’t some kind of political flamethrower, he’s a respected columnist and writer out on a tour to talk about his new book, and Piers treated him like he was a hack spokesperson for the RNC. What happened last night is a symptom of CNN’s bigger problem, and that’s that they hide behind a dishonest shield of objectivity that only serves to insult the intelligence of the Left and Right. You can’t build an audience while sandbagging conservatives like Jonah, making partisan fools of yourself like Soledad O’Brien has, or selling your soul to aid Obama’s racially divisive re-election campaign. It’s no wonder CNN’s ratings are in the dirt. CNN is not journalism. It’s a network of bitter Liberals clinging to a failing Socialist president. And their only pathetic promotion of Obama, now, is that “he’s cool”.